"Miracle on Han River" symbolizes the rapid economic success of South Korea. Once one of the poorest countries on Earth, South Korea boasts of its status as the world's 11th largest economy. Her amazing success has been achieved driven by decades of export-oriented economic policy. Now South Korea stands as the sixth largest exporter in the world. Its bilateral trade volume is bigger than that of all 54 African nations combined. She has been recording more than 1 trillion US dollars in trade volume in recent years. Behind all this economic achievement of South Korea is the contribution of Korean International Trade Association (KITA). In particular, KITA's FTA Consulting & Supporting Department has been spearheading South Korea's all-out efforts in developing her by trade. Led by its General Director Lee Dong-Bok, scores of its staff are making all out efforts for its members to benefit from the free trade agreements (FTA) South Korea signed with other countries. 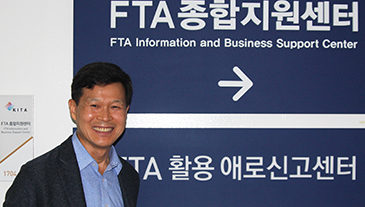 The Seoul Times has recently met with Director Lee to find out the role of KITA's FTA Consulting & Supporting Department, particularly how foreign traders can benefit from South Korea's FTAs. The following are the full text of questions and answers, the introduction of FTA Consulting & Supporting Department, and a short introduction of KITA itself. Q1: First of all thanks a lot for this interview opportunity. Could you tell us the definition of FTA? A1: The acronym FTA stands for the free trade agreement. FTA means the preferential trading arrangement, which promotes and facilitates mutual trade by easing the barriers of the tariff and non-tariff on goods, services, and other business realms. The number of FTAs between countries or trade blocs has sharply risen since the establishment of World Trade Organization (WTO) in 1995. As we are aware of, there are a total of 455 free trade agreements which has been signed so far. Among them, 405 FTA cases or 89 percent of them are currently in effect worldwide. Q2: So far, with how many countries has South Korea inked FTAs? A2: Currently, South Korea has signed 15 free trade agreements with 52 countries, which are effective now. But the first FTA she signed was with Chile, which took effect on April 1, 2004. South Korea has already inked FTA with the Central America, which will soon take effect. South Korea is also discussing FTA agreements with such trade blocs as RCEP (Regional Comprehensive Economic Partnership) and South Korea-China-Japan tripod trade agreement. including Australia, China, India, Japan, New Zealand, and South Korea. Foreign buyers benefitted from their nation's FTA with South Korea. In 2017 they enjoyed the FTA preferential tariff on more than 100 billion US dollars of their imports. Q3: Could you elaborate on the benefits the foreign buyers can get from the FTA agreements their countries sign with South Korea? A3: Foreign buyers in trade business with Korean companies are subject to import tariffs from customs authorities of their country when they imports things or products from Korea. However, they can save import expenses through the implementation of the FTAs their country signs with South Korea. Among the benefits are the lowered import tariffs and the exemption of the customs duty. South Korea maintains such systems as certificate of origin and approved exporter for the foreign buyers for the preferential import tariffs they can benefit from the implementation of FTA formed between their country and South Korea. In addition, we keep supporting the small and medium-sized companies of Korea so that they can gain from FTAs South Korea signs with foreign countries. For this we offer to them such opportunities as consulting, education, and providing various information. Q4: Could you explain to us about the role of FTA Consulting & Supporting Department? A4: FTA Consulting & Supporting Department of KITA offers our systematic one-stop services needed for the local companies to export their goods and products. We help them use the benefits of results of FTAs. We provide them with the latest information on FTAs, practical educations on FTAs, consultations on how to utilize FTAs, and assistance for any problems and solutions involving FTAs. We take full efforts in offering these services to our members. Q5: How can they benefits from the various services your department offers to them? A5: We hope that the services we offer at FTA Consulting & Supporting Department can be useful and helpful particularly for those foreign buyers in overseas countries. We strongly urge them to utilize our services. Or you can call us at 1380 without any pre number. Currently, South Korea enjoys the effects and benefits of the free trade agreements (FTA) she signed with 52 countries including Chile, Peru, Colombia, Singapore, ASEAN, India, the US, Canada, China, New Zealand, Vietnam, Australia, and Turkey. South Korean is finishing talks or nearing the final process of FTAs with many other countries and trade blocs. Chile became the first country South Korea singed its FTA with. South Korea-Chile FTA became effective on April 1, 2004. With the implementation of the agreement South Korea was able to hold the ground and to build the infrastructure to gain access to the markets in both Central and South Americas. Now she is nearing the completion of its FTA with Latin America, Korea-China-Japan, and with the countries of RCEP (Regional Comprehensive Economic Partnership). Earlier on March 15, 2012, South Korea implemented its Korea-US free trade agreement. It was the largest FTA the US has ever signed with any countries since NAFTA (North American Free Trade Agreement). For America, it was the largest FTA negotiated with any nations by her since NAFTA. The acronym KITA represents the Korea International Trade Association. KITA, established with the help of South Korean government as early as in 1946, one year after her liberation from Japanese colonial yoke, is currently the nation's largest trade business organization with over 70,000 companies as its member. With all of its people the government of South Korea, still heavily reliant on its export-oriented economic policy, wanted to grow and develop nation's economy though trade. Once one of the world's poorest nations, South Korea now stands as the fourth largest economy in Asia and the 11th largest in the world, earning its nickname as the "Miracle on the Han River." Its export volume reached 577.4 billion US dollars in 2017 while import amounted to 457.5 billion US dollars in the same year, respectively. Its main export items include semiconductors, wireless telecommunications equipment, motor vehicles, ships, and computers. Representing South Korea as one of the global traders, KITA plays in a variety of active roles including formulating new trade strategies, nurturing trade professionals, building trade infrastructure as well as providing hands-on support to trade companies, and drawing trade cooperation from the private sector. KITA now has a wide network of its own domestic and overseas. 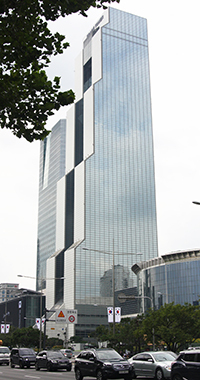 It has 13 offices on its own soil and 11 overseas branches in major cities across the globe. In particular, KITA has played a special role in assisting nation's small and medium-sized enterprises (SMEs) in their gaining access to the overseas markets. In 2017 South Korea's trade volume surpassed 1 trillion U.S. dollars. At its inception in 1946 it stopped short of exporting a meager 3.54 million US dollars' worth of goods. Now it stands as the 10th major trading nation in the world. Behind South Korea's rapid success as a major trader is the hidden efforts of KITA. On July 31, 1946 a group of 105 pioneers in nation's international business gathered to launch KITA, laying the groundwork for her economic growth. Its goal was to facilitate her global trade by setting the trade policy and by developing the national trade infrastructure. Now, KITA is all set to keep and further develop her status in the global trade war, particularly to maintain her as an global hub of the free trade agreement (FTA).